From L to R: Elizabeth Star, Peggy Keats, Sarah Rohr and Craig McGlashan. 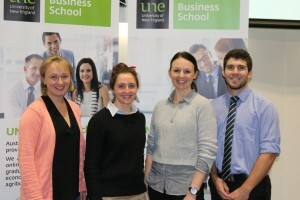 Four agribusiness students from the University of New England will represent Australia in a major competition at the International Food and Agribusiness Management Association (IFAMA) 25th Annual World Symposium and Forum in the USA in June. The annual event brings together current and future business, academic, and government leaders and other industry stakeholders. Leading agribusiness research and issues impacting the global food chain are examined in a forum of interactive presentations and discussions. This year’s conference theme is “Becoming the Solution” and will focus on Innovation, Talent and Technology in 21st Century Agribusiness. The UNE team will utilise their skills, particularly in relation to Food and Agribusiness Management, to simulate a fast turn-around analysis and presentation on an industry hot topic to a judging team made up of senior industry and research specialists. According to the team’s advisors, UNE Business School’s Professor Derek Baker and Dr Stuart Mounter, participation in the competition will help put UNE and Australian agribusiness on the international map. Head of UNE Business School, Associate Professor Martin Hovey, agrees. “The Agribusiness Student Case Study Competition is an internationally renowned showcase of future talent in the industry. The competition gives us the chance to see how New England and Australia’s best line up against, and amongst, the World’s best”, A/Prof. Hovey said. UNE’s team, comprising Craig McGlashan, Elizabeth Star, Peggy Keats and Sarah Rohr, is the only Australian team competing for the international title.